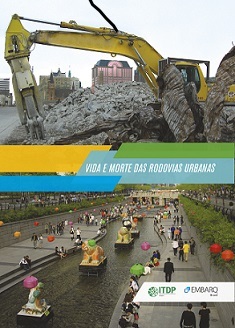 Cover for the newly released publication “Vida e Morte das Rodovias Urbanas“. Courtesy of EMBARQ Brasil. EMBARQ Brazil and ITDP Brazil officially launched the Portuguese version of “Life and Death of Urban Highways” last week, during the III Congress SIBRT: Best Practices in Latin America conference. The publication is the result of a collaboration between EMBARQ and ITDP (Institute for Transportation and Development Policy), and brings together examples of cities that have managed to revitalize and restore urban space for the people by removing or altering the construction of urban highways. Cities included in the publication are Portland, San Francisco and Milwaukee in the United States; Seoul in South Korea; and Bogotá, Colombia, all of which have effective strategies for projects and investments that resulted in better quality of life through urban transformation. The publication was written in order to show that a focus on cars is not the best option. Cities are built for people, while highways serve to move vehicles. The five cities mentioned are examples of revitalization through removal of cars, and opening of spaces to people. EMBARQ’s goal with this publication is to demonstrate the numerous ways in which cities benefit from these changes. In the case of Portland, the problem involved Harbor Drive, a stretch of road almost 5-km long along the banks of the Willamette River. Organizations in the city supported the creation of more open spaces and an increased public access to the river’s shore. After a time of discussions, the city agreed to close Harbor Drive along the river, and return its use to residents. 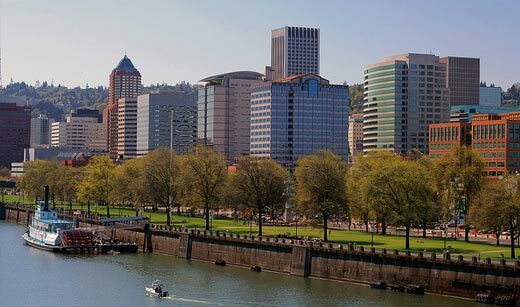 Once the road was closed, a park called Tom McCall Waterfront Park was created, which became the focal point for the renewal of the city center and the only direct access for residents on the banks of the Willemette River. Removing the stretch of Harbor Drive road created safer and more pleasant spaces for pedestrians, improving the overall quality of life in Portland. Tom McCall Waterfront Park in Portland was built after the removal of Harbor Drive. Photo by Joel MannRead more with the digital copy of the publication here. Check it out! This post was originally published on TheCityFix Brasil by Priscila Pacheco.